It’s that time of the year again! March Madness is here, the best time of the year for college basketball. There are plenty of intriguing story-lines that led up to this point, but none more enticing than Kentucky. Can Kentucky be the first team since Bob Knight’s 1976 Indiana Hoosiers to complete the NCAA Men’s basketball season undefeated? The Hoosiers were 32-0 that season, it will take Kentucky 40-0 to complete the feat this season, and you have to like their chances. Can Notre Dame ride the momentum of beating Duke and North Carolina back-to-back to win their first ACC tournament? Only time will bring the answers to these and many more questions (will 12 seeds keep the dream alive by continuing to beat 5 seeds?). This year, I created my own little formula to rank the teams in the tournament to eliminate personal biases and subjectivity. Well, the factors included in the formula are subjective to what I feel you need to win in the tournament, but by applying them to all the teams, I am evening the field. 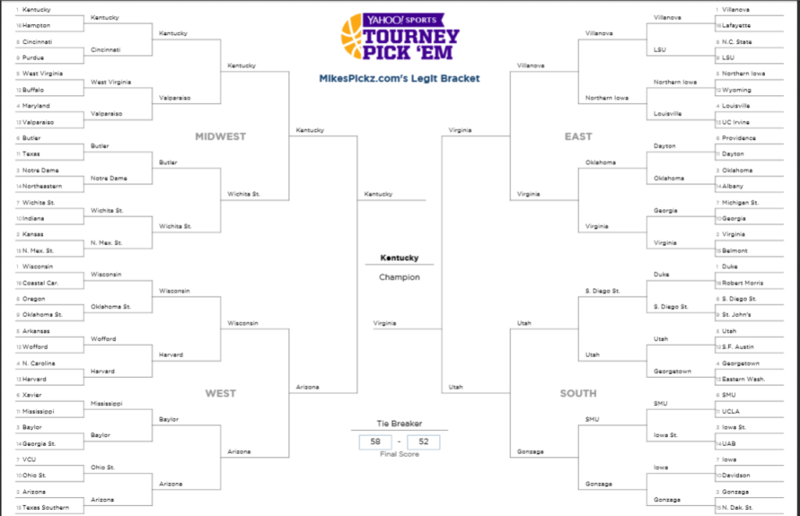 Here is my 2015 bracket. I will update this page with results as the tournament progresses. It was a wild Thursday slate of action, with a relatively calm Friday during the Round of 64, but all things considered, my bracket is in decent shape for the rest of the tournament with all my Elite Eight teams still in the tournament. The Round of 32 busted my bracket pretty good. I failed to give Tom Izzo the credit he deserves for his hot March run and his Michigan State team took down Virginia, whom I had in the Championship. I still have 6 of 8 Elite Eight teams and 3 of 4 Final Four teams, but it will be hard to make up the damage the Round of 32 did to my bracket.